The one thing you’re going to want in an indoor training room – apart from a flat-screen TV and a mini-fridge of course – is proper ventilation. The physics is pretty simple – when you’re exerting yourself on your indoor cycling machine, your body is generating heat. This bubble of heat, if there’s no air circulation, makes it difficult for your body to cool down by letting your sweat evaporate, making the whole process of going through with your workout a lot more difficult than it has to be. The solution? Use a fan. A properly situated, effective fan can help keep the air moving, letting you cool even as you generate heat so your body can maintain an ideal core temperature. Take a look at our picks for the best fans you might want to consider for indoor cycling. 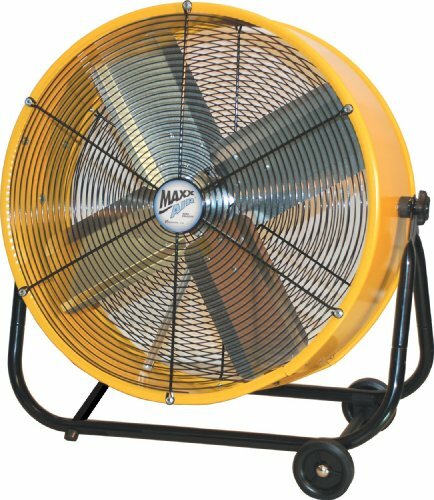 An industrial grade, heavy-duty tubular steel fan you can prop up right in front of you as you work out, or mount on the wall directly opposite so you get the best exposure to air flow, this fan is equipped with three, adjustable speeds to suit your needs. Three metal blades work together to create enough air movement to keep the circulation going even in larger rooms. Highly portable, with its compact design and built-in carry-on handle, the fan can be moved around the house or your training space so you can use it not just while cycling but during other exercises and workouts as well. Since it is recommended to situate fans such that they hit our skin and encourage sweat to evaporate and thus cool the body, this fan’s pivot functionality is useful in ensuring maximum exposure, allowing you to experience air flow as fully as possible while you exercise. The fan comes with a bracket to mount it up on the wall of your training room, as well as rubber padding to protect surfaces including your floors from undue scratches, as well as to hold it securely in place. While this fan does not come with a handy wall-mount feature, it does nonetheless have a 360 degree tilt capacity that lets you adjust the direction of air flow to suit your needs, the feet of the fan with the right grip to keep it perfectly stable and upright. 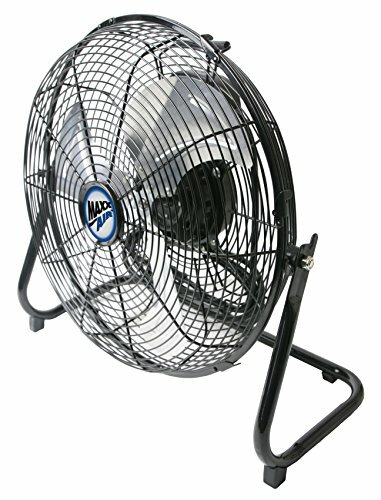 The durable metal contraption has a powder coat, making it rust-proof, while aluminum fan blades offer three adjustable air flow speeds you can choose from. Despite the power this fan packs, it leaves a considerably smaller footprint, equipped with a thermally protected 120-volt motor. Thanks to the 72 inch power cord, it’s also easy to move around, as you can simply plug it in and use the convenient carry handle to move it over to where you need it. Ideal for smaller, stuffy rooms, this utility fan keeps the air constantly circulating and ensures it doesn’t grow stale or unhealthy. With an in-built circuit breaker and two 120-volt grounded outlets, the blower offers three adjustable speed options to choose from. Despite its compact nature, the machine is a powerful one, operating at almost thrice the strength of a bigger machine, with a sturdy carry handle and adjustable angles that let you control the direction of the air flow. Relatively quiet and therefore unlikely to disrupt you as you watch TV or listen to music during your workout, this blower is also handy at keeping humidity in check indoors, working well to keep your carpets, walls, floors and so on dry. This also makes it ideal for use in spaces such as basements or smaller, cramped rooms where you may be using your training or cycling equipment. A robust device with a 22-gauge steel construction and rust-proof grilles, this fan comes with an adjustable 180 degree tilt that lets you direct air flow at two possible speeds. 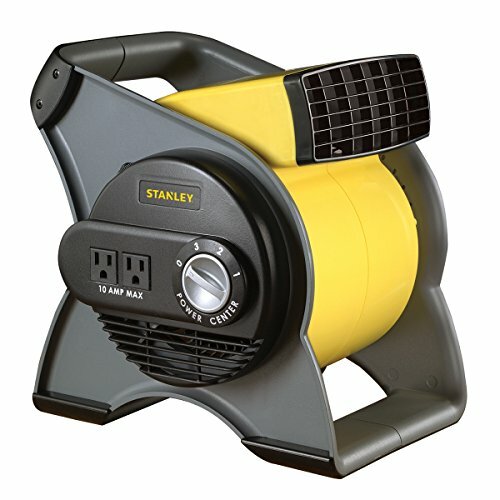 The four-blade design makes for a quieter fan, while both the 8-foot power cord and snap-on wheels allow for mobility, letting your easily move and position the fan where you need it. Perfect for small or medium sized rooms, the fan is a sturdy device with non-skidding legs to ensure maximum stability, both UL and CUL listed to guarantee safety. Moving air is an integral part of the physics involved when exercising – it helps our sweat evaporate off the skin, which in turn lets the body cool down rather than stew in an increasingly warmer bubble of trapped heat generated by our own muscles. The ideal position to set up a fan when cycling indoors is in front of you, adjusting the angle just so in order to have the full blast of the air flow hit as much skin as possible. Wall-mounted options are great for this, since they can be positioned such that the air flow touches your front, arms, legs, shoulders and so on, but the right floor fan can also do the trick. Flexibility is important, so look out for options which have adjustable angles or 360 degree tilt, to let you control the direction of air movement. An automatic pivot feature is another useful attribute for electric fans to have. Sturdy, rugged construction promises durability, but it’s important to look out for powder-coated or otherwise rust resistant designs, especially when it comes to industry-grade, metallic fans. Fans with individually balanced blades ensure better stability and less likelihood that the device will rattle against the floor as the blades spin. Stability also depends on whether or not the fan is propped up on a sturdy frame, ideally with two to four legs padded with a strong, non-skid grip. 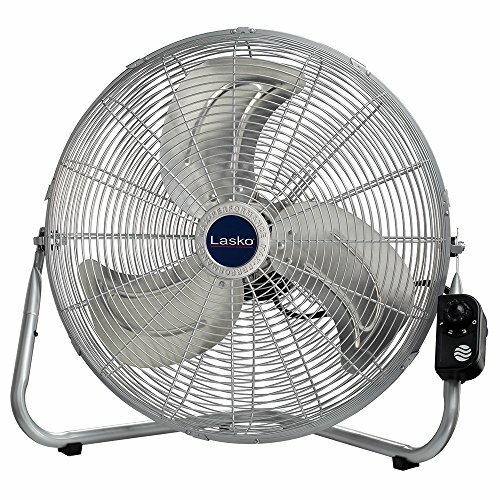 Fans with adjustable speed options are also ideal, as you may not always need them going at full blast, and a single velocity fan might be more of a distraction, being either too overwhelming, or simply noisy and troublesome if you’re trying to work out while watching a series or listening to music.